I made Rugelach to share today in honor of my great Aunt Ruth. She turned 94 last weekend and I packaged these sweets up for her and sent them to California. They seemed to arrive in one piece (yay!) and she shared them over a cup of coffee with a friend. She meets this particular friend often for coffee and they sit and watch the waves crash onto the rocks– sometimes even from the warmth of the car or other times at the coffee shop. Aunt Ruth made these for many years but hasn’t baked much recently so I wanted to surprise her with this rugelach. She liked that I cut the dough into triangles and rolled the rugelach in the traditional fashion. Often in stores today you’ll find the faster (but still tasty) method used in which a rectangle of dough has been layered with filling then rolled into a log shape. You then slice pieces of the rolled log into segments and bake. Aunt Ruth shared her recipe with me years ago and I turned my kitchen upside down looking for it to no avail. Instead I relied on this recipe from Southern Living for the cream cheese-based dough and then I made the filling as I recalled Aunt Ruth’s preference for a cinnamon raisin mixture. She said she and her friend both enjoyed the results so this was a baking success! If you love holiday cookies, give these cookies a try too: almond lace cookies, amaretti biscuits, or salted caramel macarons. The theme this month for the #CreativeCookieExchange is International Winter Holiday Cookies! If it is a cookie traditionally made somewhere in the world for a holiday traditionally observed near the Winter Solstice you might find it on this list. If you are a blogger and want to join in the fun, contact Laura at [email protected] and she will get you added to our Facebook group, where we discuss our cookies and share links. A food processor brings this dough together quickly. Mix the flour, butter, cream cheese and salt in a food processor. Pulse first a few times then run until the dough just pulls off of the sides of the bowl and starts to come together in a ball. Wrap dough in 2 flattened balls and refrigerate for an hour. Meanwhile, make the filling: Again in the food processor pulse the brown sugar, walnuts, raisins and cinnamon about 10 times or until in small bits and pieces. When the dough is chilled, divide again into half and roll each piece into a circle with the dough approximately 1/4 inch thick. Cut the circle into twelve pieces using a pizza cutter or sharp knife. Whisk the egg white and water together in a small bowl. Brush the egg white and water mixture onto the dough. Top with some of the filling and then roll each triangle from the outside towards the center. Place on a parchment lined baking sheet. Brush with additional egg wash if desired and top with a sprinkle of sugar and cinnamon. Bake at 375 degrees for 20 minutes or until lightly golden brown. Let cool on wire rack. 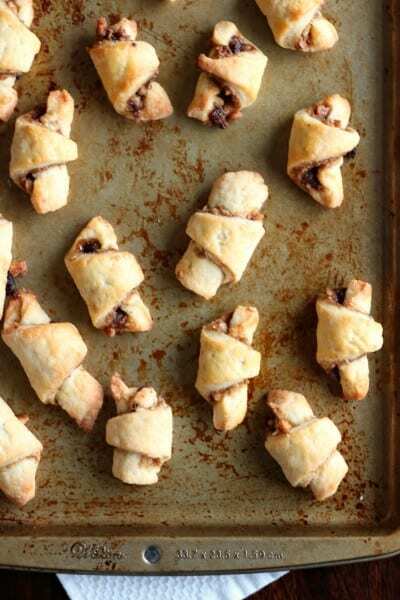 Each year I say I’m going to make rugelach and never do. I think you have given me the nudge for this year because this looks so good. Thanks, Renee, I think these will become a tradition at my house too! 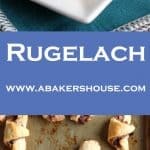 I love that you made Rugelach. I’m Jewish and I love making and eating Rugelach. 🙂 Such a lovely story about your grandmother! I’m glad you were able to send her such a delicious treat. Thanks, Sophie, have a happy Hanukkah celebration! What a sweet story Holly! Your great aunt is very lucky to have such a caring (great? grand?) niece. What an incredibly sweet gesture! I am sure Aunt Ruth must have blessed you from her heart! And She must be proud of you for a successful baking adventure as this one. Thank you, Ansh. 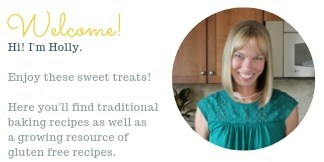 I need to make more of a habit of baking and sending food gifts to my aunt and my grandmothers too. It is especially nice to share baked goods with those who enjoyed baking in their younger years but no longer have the opportunity to do so. I used to make these with my Grandma and always loved them but I haven’t made them myself in years. I love your filling; always a favorite of mine to as opposed to a jam. I can only imagine how touched your great Aunt Ruth was Holly; such a nice thing. Amazing how much older people can be so easily pleased by the simplest of gestures; they just love gifts from the heart and this surely was. Thanks, Barb. You are right– gifts of food come from the heart and mean a lot. You should know, you are always bettering someone’s day by sharing your delicious food! This looks amazing! I would love to try making this! 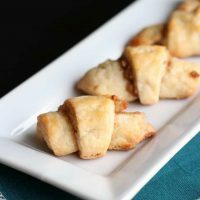 I hope you find time to try this rugelach. You can vary the filling– anything from jam to nuts or even chutney would be nice. This is classic rugelach, right? Seems to me the first time I tasted the delight was at a deli in West Hollywood as a freshman in college. Yours reminds me of the cinnamony wonder I experienced. Aunt Ruth is lucky to have you as a niece, Holly! I love that you made them the traditional way also! Great choice for this month! It’s sad that I’m the only rugelach lover here… enjoy them for me!